The Fuego! 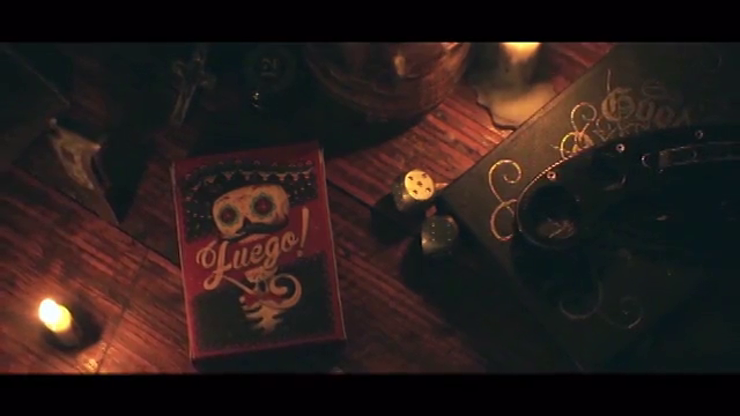 Playing Cards are the debut deck of Cellar Window. It had a limited print run through LPCC (Legends Playing Card Company). These cards are inspired by the works of Mexican political printmaker JosÃ© Guadalupe Posada and his Calaveras and the Latin phrase "Memento Mori". Every design is illustrated in-house in a very colorful and detailed style. The tuck case features the classic long flap, perforated custom stamp seal, inner calavera motif print and exterior embossing to further accentuate the design and to give added texture. The Back Design is given special attention that appeals to talented cardists as well as the avid collector with its minimalist approach coupled with an intricate touch. Fuego! is manufactured by Legends Playing Card Company on traditionally cut European card stock and Emerald Finish, with precise printing registration making it possible for really thin borders and cards that have a great snap and feel to them. If you have ever handled some of the premium decks from LPPC you will know first hand that their status as one of the top in the playing card manufacturing world is self evident. Simply enter your details below and we will send you an e-mail when “Fuego! - Day of the Dead Inspired (Sol Edition) Playing Cards” is available to ship!